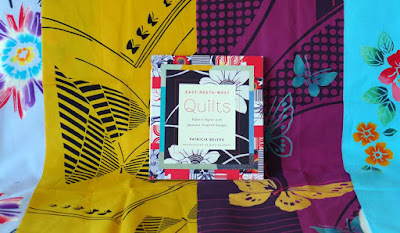 Book Review: "East Meets West Quilts: Explore Improv with Japanese Inspired Designs"
"Enjoy the delight of discovery as you try something new. Give yourself permission not to know exactly where you are going. Yet note that creating improvisational quilts is never arbitrary or accidental; It requires active discernment in determining each design choice." 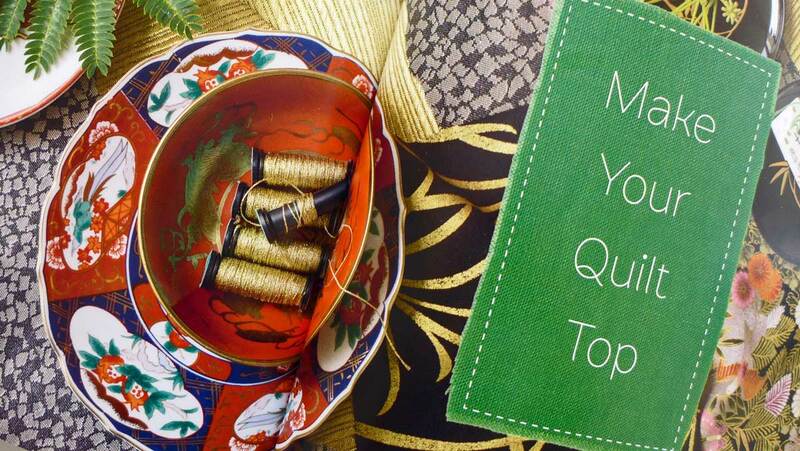 In her book "East Meets West Quilts: Explore Improv with Japanese Inspired Designs", Patricia Belyea introduces the quilter to a fun and fresh method of improvisational piecing using Japanese prints as her inspiration. Written by Patricia Belyea. Photography by Kate Baldwin. Published by Abrams, New York, 2017. 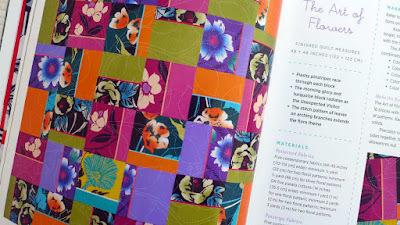 Patricia's comfortable approach to improv piecing eases the reluctant improv quilter (eg. ... me) to drop those nasty self imposed inhibitions and restrictions and have fun playing with colour and pattern, while at the same time providing a safety net with a few basic concepts. Using strong solids next to vintage yukatas, as in "The Art of Flowers", Patricia's simplified approach to improvisational piecing makes the process attainable and fun . Her choice of fabric, colours and layout are symbolic and thoughtful references to Japanese culture. Each quilt presented is accompanied by a brief description of the tradition represented in the quilt, as in Sakura Spring, which references the cherry blossom season. 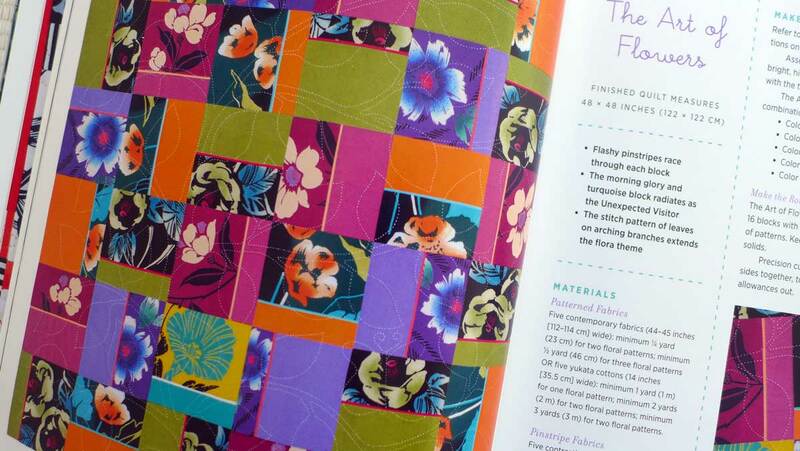 Clear, concise construction directions accompany each quilt showcased in the book. The last two chapters present basic quilting instructions with some innovative finishing techniques. Beautifully written and photographed, the book takes the reader on a cultural exchange, where Japanese fabrics and western quilting techniques create a fresh and freeing take on improv piecing. Vintage Japanese cotton prints, called yukata cottons, frame the book. 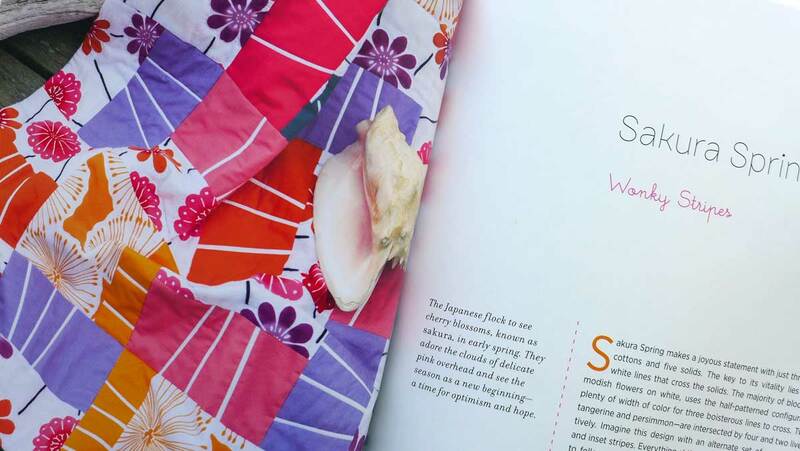 "East Meets West Quilts: Explore Improv with Japanese Inspired Designs"
is available through Amazon and on the Okan Arts website. What a lovely book! Thanks for the review! Hi Karen. It is a beautiful book, well written and lovely photographs. The door of her cage has been opened. She is free to fly off and find her destiny. After many months of hand stitching and then many more months of cording, my little "calibri" is ready to set off on her own. As this was my first attempt at designing so large a boutis piece, it has been a bit of a learning curve. All of the tight swirls, curls and circles are a great deal more difficult and time consuming to cord then are the longer more gentle channels. Maintaining an even tension is absolutely necessary throughout the process, so patience comes in very handy when doing the cording. Once all of the stitching and cording is complete, the boutis must be washed and squared up. After it is soaked overnight in a basin of water with a mild detergent, it gets rinsed gently in several clear washes, then rolled in a towel to remove the excess water. Esther Miller, was born into an Amish family in the U.S., and now lives in Germany where she has for many years taught the techniques and methods of Amish hand quilting to anyone interested in learning these skills. As a child, she would closely watch as the women of her community worked together on a quilt, and eventually she was rewarded with a needle of her own and encouraged to join the group. Through the years, she has mastered these skills and techniques and now generously shares them with anyone who has a genuine desire to learn. The quilt exposition in Nantes "Pour L'amour du Fil" was filled with a number of highlights. Certainly one of the more memorable experiences was seeing the works of Yoko Saito in person. "Elegant" is the word that best describes Yoko Saito's quilts. Although her palette is neutral, the lights and darks play very well together to create a perfect balance to the quilt. To say that the applique is amazing is an understatement. The perfectly formed 1/4" circles and the tiny leaves and stems are inspirational. And of course, the hand quilting is perfect. For the final touch, she uses embroidery as adornment in much the same way that the perfect pair of earrings complete the look of the little black dress. The opportunity to see her quilts in person has been truly inspirational.